If you're a gadget freak like me, you carry lots of electronics with you most of the time. My new car has only two power outlets. So what do you do if you're on a long trip, your GPS unit's power supply is taking up one of your power outlets, and both your cell phone and your companion's cell phone need charging? Proporta comes to the rescue with their Car Power Supply with Dual USB Sockets ($14.95 USD). Many new devices use a USB cable for charging, so Proporta's supply is just the ticket in this situation. It features 2 USB sockets flanked by the ubiquitous blue LEDs on either side. I've grown to rely on quality materials and construction from Proporta's products, and the power supply lives up to those expectations. And how well does it work? Very well indeed. My Garmin GPS unit, Sansa View music player and Plantronics Bluetooth headset were all accommodated nicely by the Proporta charger. However, be aware of the fact that some devices don't support charging in this manner, even if they will charge when the USB cable is connected to a computer. My Motorola Q smartphone is one example... it will charge when connected via USB to my laptop, but not when the USB cable is connected to a power adaptor. So while my Q doesn't work with the Proporta charger, it's the phone's fault, not the charger's. The Car Power Supply is ideal for long trips and emergency use, and $14.95 is a small price to pay for so much convenience. Highly recommended. You can order one online here. Doug Raeburn is a data architect specializing in data warehouses. He lives in Pewaukee, WI. Slick! Nice and simple - I'll have to track one of these down. Since it's a USB charger I assume it runs at 5V, but what amperage does it run at? I couldn't find that info on Proporta's website. I reviewed a similar unit recently and the 2 different USB ports charged at 2 different amperages. Some devices require the higher amperage so it would be helpful to know. Thanks! Indeed -- I have one similar to this but with only one USB port. It must be a low amp -- it can charge my phone decently only when GPS, phone, Bluetooth are off. If I have GPS and the phone on, it uses power faster than the charger can keep up. Has anyone tried this adapter with Zune2 4GB? 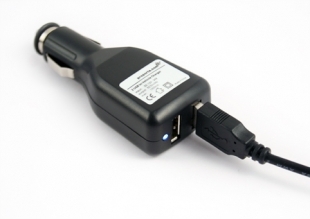 I`ve a similar USB Car Power Supply which works fine with mobile devices (smartphones, bluetooth headsets). But when I want to charge my Zune it looks like there is not enough power on it? I don't know the answer to the amperage question... I'll see if I can find out through my Proporta contact. Yeah, the Zune is pretty power hungry: it needs a full 1 amp, and many USB chargers only kick out 500 mAh or 800 mAh. If you still have the unit it should say somewhere on that silver label I see in the photo. Unfortunately the photo isn't big enough (high enough res) for me to make out that kind of detail! It does make a big difference when charging a Zune or iPod classic or iPhone or even some of the more power-hungry AIO GPS devices or a PDA. A lot of these charging devices only offer 500mAh or maybe 750mAh when you really need even higher values to get some devices to charge reliably. Yeah, I still have the unit... I'll check it tonite when I get home from work. OK... the label on the unit says "max: 1000mA".